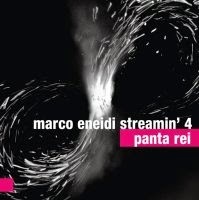 This is the debut album by American (resident in Austria) saxophonist Marco Eneidi and his Streamin` 4 quartet, which also includes three Polish Free Jazz/Improvised Music musicians: saxophonist Marek Pospieszalski, bassist Ksawery Wójciński and drummer Michał Trela. The album, which was recorded live, presents four extended pieces, co-credited to all four participants. As appropriate for an Improvised Music/Avant-garde Jazz encounter, the music is highly energetic and expressive, with the participants trying to stay coherent and communicative towards each other. The double saxophone lineup allows for separate saxophone solos and a side-by-side dialog, which varies in intensity and intension from one moment to the next. The rhythm section is also allowed space to express its notions, but as usual remains in the background for most of the duration. It becomes pretty obvious that at least some of the themes used as the basis for the improvisation were annotated or rehearsed in advance, but of course, as usual in such circumstances, they are really a marginal issue in these proceedings. As I always emphasize, this kind of music is essentially meant to be a part of a live experience and is received in a completely different way by a live listener sitting in the audience than when listening to the recorded music. With the intimacy and immediacy gone, the listener is left with just one more Improvised Music album, which fails to leave a lasting impression. Of course these are very skilled and talented musicians and the music has its intrinsic value, but considering the vast amount of great new music becoming available on a daily basis, this gets pushed back into the low priority stack.